As I type this it's Midnight and I'm sitting here watching the Power Pressure Cooker infomercial like it's an actual TV show. Crazy part is I got excited because I tend to look at just about everything through my marketer's glasses and... well... marketing excites me. :). Anyway, I'm watching and I notice some key things that I think ANY business should emulate in their marketing. I mean, from what I've seen and read, the infomercial business is no joke. And the good ones are masters at getting folks to whip out their phones or computers and order stuff... whether they need it or not. Even at 3 in the morning! Before & After: They paint a very vivid picture of what your life is like BEFORE using their amazing thingamajingy and what your life will look like AFTER using it. They spend a LOT of time showing you their features by actually showing you their benefits... the features in action. So you have no doubt about how their product will benefit you the most. Irresistible Offers: They make the deal virtually irresistible. But it's in part because of #1. They've spent so much time showing you benefits that by the time you see the price you're already sold. Then they throw in a "free next day shipping" or "make 2 payments instead of 3" or "get this other amazing thingamajingy as a free gift" and you start thinking of all the fun you're gonna have with your new thingamajingies... when you get them in 3 days. Which brings me to my next point. Instant Gratification: They give you the promise of fast, instant or almost instant gratification. So they may say, order now and get instant access to our members only forum where Superstar Guru Guy will answer any questions you have. Or, as I already said, they give you super fast delivery. No Risk: They take away your risk with a "we must be crazy" guarantee. Don't like it, send it back and get a refund. AND keep all the other goodies we gave you to go with it. Why? Because most people want that assurance before they hop off the fence. Annnd most people don't send it back. Automated Interrupts: This one is where I LIVE! They have automated repetition. If you saw the infomercial one time and that was all, how effective would that be? So they have it play eeevery night... same bat time (pretty much), same bat channel (even multiple channels). Why? Because people aren't thinking 'bout you. 🙂 No really. Think about all that you have going on in your life on any given day. It takes repeated conscious interrupts to get people to remember who you are, what you do AND why they should care. Here's a test... how many Super Bowl commercials do you remember right this minute? And how much did those advertisers pay for those 60 second spots?! Another test... how many times have you remembered a funny commercial but for the life of you couldn't remember who or what product it was for? Now you could add trying to get regular face time to your daily list of to-dos, but shoot, who wants a longer to-do list? OR you could automate it! These strategies are actually pretty simple to do, in any type of business. Offline or online. The principles of buyer behavior are universal. I know I've now said thingamajingy way too many times... cut me some slack, it's late. NOTE: Want a step-by-step blueprint to automate your marketing, create time freedom and still multiply your profits? 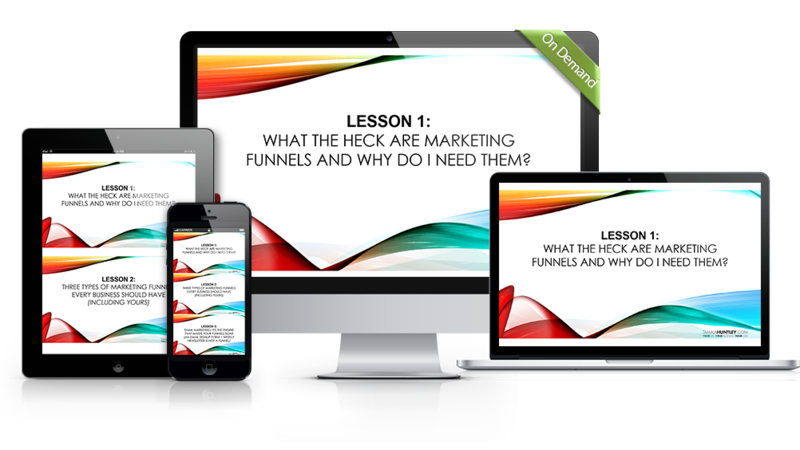 In my Marketing Funnels Crash Course I take you by the virtual hand and walk you through how to do exactly that. Get the deets here.